Our architecture studio, located in São Paulo, Brazil. O nosso estúdio de arquitetura, localizado em São Paulo, Brasil. This is my blog and also where things happen on this site. I post there about almost everything I do, so be sure to check it for fresh news. It is open for anyone to read and write, so don't hesitate to leave me some comments! This section presents architecture projects completely made and conceived by myself or in collaboration with friends. Feel free to download and reuse the available files. An open-source project for a modernist house in the grand tradition of Brazilian modernist dream houses, that works in northern hemisphere climates. A project for a n UBS (Unidade Básica de Saúde - Basic Health Unit) in Brasil. Taking grip on the new very human policies of the Health department in Brazil, we tried to make it a home, rather than a hospital, and consider health as a holistic matter, where architecture can truly play its symbiosis role. Project made with Maíra and Mário Francisco Arquitetura. A project for a small services and commerce center, typically aimed at the local bairro. Made with Maíra and AKF. A project for a high-density mixed-use compound in Itu, Brazil, based on a urban functioning organized around a central public space. Made with Maíra and AKF. A competition entry for the Belo Horizonte Administrative Centre competition, made with Maíra. A competition entry for the Yaroslavl Spartacus Alive competition in Yaroslavl, Russia, made with Maíra. A proposal for a new roof for the central open space of the Public Market of Florianópolis, Brazil, made with Maíra. Uma proposta para o Parque Augusta em São Paulo, Brasil, feita com Maíra. English text available here. A green factory project in Brazil, made with Maíra and Mário Francisco Arquitetura. The buildings are totally open, rely heavily on natural ventilation and lighting. An ongoing project made with Maíra for an open mall in Marília. A theorical neighbourhood-wide green roof project made with Maíra for the Gowanus canal competition in New York. A project of a house for Lívia and Grégoire made with Maíra. The idea is a very simple shell, made with bioconstruction, that simply defines a frame in a garden. A project made with Maíra, Angélica and Sander for the cachaça 51 in Brazil. A proposal Maíra and me made for the Interlagos Formula One circuit in Brazil. The whole project was made in collaboration with HVC Arquitetura, and rendered this animation. A project Maíra and me made for an open shopping mall in Brazil. It is a solid, dense stack of shops and offices wrapped around an oasis-like tropical courtyard. More images and 3D files here. A project entry for the Frei Caneca competition in São Paulo. The project is actually a "non-project", made of 100 micro-interventions without any masterplan. Made with Angelica, Maíra & Sander. More images here. A project entry for the OpenFort 400 competition in Amsterdam. The proposal investigates density, stacking, and infectious spots as ferment for innovative urban design. More images here. A quite theorical competition project for the new Faculteit Bouwkunde building of the Delft University, that was, although the result is far from usual, a tremendous reflexion experience. Made with Maíra & Sander. 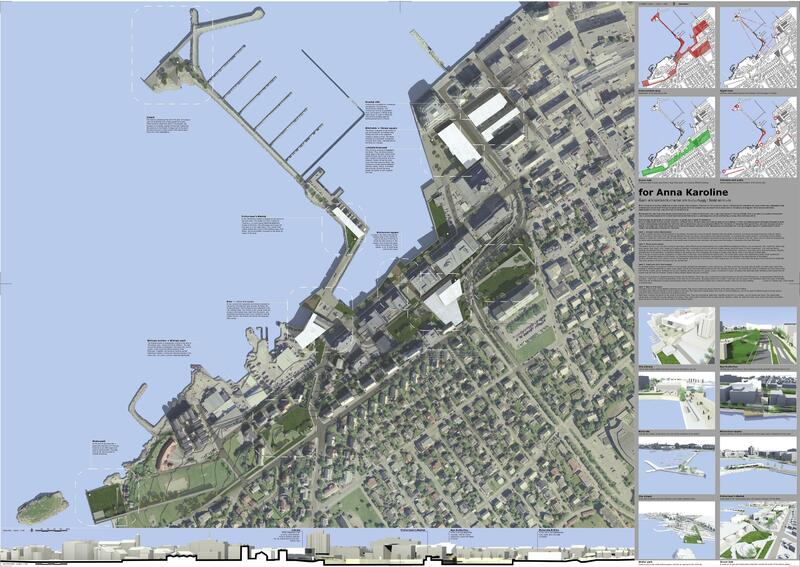 This is a competition for the transformation of the old harbour of Bodø, Norway, into a living city waterfront. The project was made with Angelica, Maíra & Sander. This is an entry for a competition held by Arch for Humanity in Ecuador. The proposal gathers different "modules" under one big slab-like roof, assembled like a space station. The full entry documents can be found here. A competition project for a residencial building in Lima. Mainly a reflexion over diffraction, opening, circulation space as a social system and a quest for some new life quality. Made with Maíra and Janis. Another competition project made with Maíra and Thomas in 2003 for a community centre in Kapolei, Hawaii. This one focused around integration between human being and environment. A competition project for the new city hall of Moscow, Russia, made in 2002 with Thomas. The project constructs itself on a grid that grows in all directions, spreading out of its bath. A competition project for a housing complex in Aomori, Japan. Made in 2001 with Maíra. It deals with difference of scales in surrounding urban environment and heavy population density in compact area. It also suggests different daylife routine and social interaction. Here you'll find architecture renderings and other types of graphical work, architecture documents, drawings, websites, logos, animations made for other architects or planners or, before 2006, while working in architecture studios. Want to hire me? See how to contact me? That's the place. These are the most recent architecture animations we made. The older ones can also be viewed with less quality here. The latest ones, fresh from the oven. Still fairly empty! All the works of 2016: 3D, Construction documents, and a series of our own projects. The complete works of 2008. Contains a bit of everything me and Maíra did during that year. This page shows works made in 2007, with some sketches, perspectives and 2d drawings of architecture projects... As always now, all 3D is made with Blender. Some of the works made in 2006. That year we started to work as independent free-lance architects. Works made in 2005, mostly at Cabeza Sastre. Works made in 2004, also at Nasser Hissa. Works made in 2003 while working at Nasser Hissa Arquitetos in Fortaleza. This page contains scripts and themes I made for Blender, all freely available to download and use as you wish. This page contains plugins for wordpress. They are also available via the wordpress plugin repository. A short article explaining what kind of architecture workflow you can do on Linux. This is a repository of (hopefully) realistic plants and trees made with ngPlant and Blender, for use in your 3D scenes as 3D models or as alpha textures for billboard-style vegetation. This is a quick comparison of what I could get from several free external renderers availables for blender. This is not an extensive comparison, but a quick test of what a new user can expect to achieve quickly. This is a plugin I made for ngPlant, that allows to render an image directly from it, without the need to export to another program. This is my collection of ngPlants, the same used to create the plants textures in the textures section. You can now download all of them together with the textures. A tutorial showing two examples of how Blender can be used in designing very large urban environments. A tutorial about modeling architecture precisely in Blender. An article showing how Blender is an excellent platform for architecture creation, based on a project I made some time ago. An article showing how to make parametric objects in Blender. A tutorial showing how to model realistic-looking vegetation with open-source tools. A tutorial specially destinated at architects, to show the basics of open-source programming. Un synopsis que j'ai écrit un jour, et dont je ne sus que faire, sinon l'utiliser pour allonger cette page, à défaut d'autres usages moins honorables. Some old and simple flash animations I made mostly to entertain friends, but that neverthless were good training for discovering animation techniques. My links collection, now self-hosted.